This report focuses on the 220-hectare Hacienda Tinang in Tarlac, once owned by Benigno Aquino Sr. and sold to the wealthy de Leon family of Pampanga. It narrates how the de Leon heirs circumvented land reform by faking a voluntary offer of sale where the land was supposedly sold, in smaller parcels, to “farmer-beneficiaries.” These beneficiaries, however, were actually members of the clan, which includes some of the country’s wealthiest bankers, business people and socialites. The story is much more than that of the circumvention of the law or the loopholes in the land reform program. It is really a story of power and wealth in the country, and how the families that own land and wield power are able to protect their interests. BGY TINANG, CONCEPCION, Tarlac - When President Gloria Macapagal Arroyo last week began her six-year term, her inaugural address had one glaring omission: it made no mention of land reform. But it was an omission that was barely noticed. To many, and especially to the government, land reform is practically a done deal, a program nearly complete, and about which little more need be said. But here in this lonely landscape of endless sugarcane fields stretching far, far into the horizon, farmers cannot help but feel that something remains amiss with the Comprehensive Agrarian Reform Program (CARP). In fact, all they have to do is point to the sprawling Hacienda Tinang sugar estate here that was awarded under CARP to 77 members of some of the country's wealthiest families-investment bankers, socialites, businessmen, and friends and relatives of the country's top politicians. The surnames alone of these CARP beneficiaries are dead giveaways of their privileged background: Jalandoni, Rufino, Panicucci, de Leon, and Escaler-including Ernest Escaler, the flamboyant and high-flying businessman-investment banker who two years ago got embroiled in a bribery scandal related to the IMPSA power plant contract. These individuals reside in posh condominiums and exclusive enclaves like Dasmariñas Village, New Manila, Ayala Alabang, and Forbes Park. They have never lived here and have never tilled the land nor managed it. They even include a junior high school student now enrolled in Canada and who was less than 10 years old when he and other members of his clan became "farmer-beneficiaries" of their own 212-hectare estate. CARP was supposed to empower the peasantry and eradicate rural poverty by giving land to the poorest. But since its inception, landed interests have been resisting CARP-and succeeding. In an agricultural community like Tinang, what makes this possible are the feudal relations between farmers and landowners, as well as political patronage between the elite, and the bureaucrats and local officials implementing the land reform program. Under CARP, farmer-beneficiaries are supposed to be landless residents of the barangay or the municipality where the land is located, and had done direct work on it, whether as tenants or regular or seasonal farm workers. But here in Tinang, members of the rich de Leon clan found a way to keep their land through the Voluntary Land Transfer (VLT) scheme, a method of land distribution that requires no government money and minimal intervention from the Department of Agrarian Reform (DAR). How they did that and how this remained undetected for nearly a decade exposes the many flaws of a program that was supposed to be the cornerstone of former President Corazon Aquino's social justice agenda. "If you ask me are we tenants, are we farmers, no, we're not," says Michael Escaler, a 54-year-old member of de Leon clan, which owns the Tinang hacienda. "Are you asking me how I got there, how it happened, I have no idea." Escaler is a sugar miller and shareholder of the National Life Insurance Corp. Yet his signature, as well as those of his relatives, appears on numerous documents now on file at the Municipal Agrarian Reform Office in Concepcion, Tarlac. The documents entitled them to individual Certificates of Land Ownership Award or CLOAs, now filed at the Tarlac Register of Deeds. CLOAs are titles to the land supposed to be given only to the landless farmer-beneficiaries. Controversies have hounded CARP's implementation since it began in 1988. But many of the problems that have surfaced have had more to do with disputes over land bought by the government under the compulsory acquisition and Voluntary-Offer-to-Sell (VOS) schemes. Much has been said, too, about landowners' resistance to land valuation by the Land Bank of the Philippines. Apparently, however, landowners were also trying out the VLT, which soon became one of the more convenient ways for them to get the government off their backs on the issue of land reform. Aside from Tinang, other VLT cases include the 11 haciendas totaling nearly 5,000 hectares owned by businessman Eduardo Cojuangco Jr. in Negros Occidental. These landholdings have been the subject of protests by restive farm workers who say Cojuangco retains control over the land, despite having submitted them to a VLT scheme. In the case of the Tinang estate, Escaler says, "I'm just guessing but maybe we gave 75 percent to the planters or the tenants. And maybe the balance that was declared was divided among the heirs. I think that's probably what happened." As to how his signature got on the CLOA papers, he explains that he may have just signed them without bothering to check what they were. Says Escaler: "I will just sign it if you tell me to sign it." Farmers here acknowledge that the de Leons did give up part of their land in Tinang planted to rice and corn back in the 1970s under then President Ferdinand Marcos's land reform program. More than 200 hectares planted to sugarcane, however, remained in the family. But CARP soon caught up with them, and by the 1990s, the de Leons were supposed to let go of the sugar land. CARP allows landowners to retain some of their property, but as DAR records show, the de Leons managed to circumvent the limits set by law. Under the law, landowners are allowed to retain five hectares each, and their children, if they qualified, three each. But the landowners comprising 11 de Leon siblings did not apply for retention, and opted for the VLT scheme, an arrangement whereby landowners voluntarily sold all their land to qualified farmer-beneficiaries.The "buyers" of the de Leon property, however, were not landless tenants, farm workers, or tillers that the law said farmer-beneficiaries had to be. Instead, they were the de Leon landowners' children and grandchildren who claimed, in documents signed and submitted to the Municipal Agrarian Reform Office, to be farmers and farm workers in the de Leons' employ, and residents of this barangay. These documents were prepared with the help of the barangay captain, acting as representative of the Barangay Agrarian Reform Council (BARC). The barangay captain is the son of the de Leons' caretaker and belongs to a family that residents say is much feared in the village. Last year, this barangay captain took over his father's position as the de Leons' overseer. "This is tantamount to misrepresentation and grounds for the revocation of the VLT," says DAR Assistant Regional Director for Operations Teofilo Inocencio. He also says the DAR Region III is planning to create a Task Force to look into the de Leon case. Yet in 1995, Inocencio was provincial agrarian reform officer in Tarlac; it was he who gave final approval to the de Leon VLT. The de Leon property here in Tinang shares boundaries with an equally controversial landholding of another branch of the Cojuangco family, Hacienda Luisita. But unlike the Cojuangcos, the de Leons have never lived in their Tinang estate, which was titled in the name of 11 de Leon siblings who married into similarly wealthy clans such as the Escaler, Madrigal, Jalandoni, Lichauco, and Prieto families. Their offspring, in turn, married their cousins or into other wealthy families such as the Osmeña, Lopa, and Rufino families.Their names alone connote wealth and power in the Philippines; their reach and clout in business, government, media and even civil society are extensive. They also share feudal and patronage ties with those in charge of implementing CARP, making it rather simple for them to become CARP beneficiaries and fend off a genuine land distribution program. Aside from Ernest Escaler, the Tinang farmer-beneficiaries include:* Michael Escaler, a director of the National Life Insurance Corporation, he is also chairman and president of Pampanga Sugar Development Co Inc. (PASUDECO), and president and chief executive officer of Sweet Crystals Integrated Sugar Mills (SCISM). He runs a firm called All Asian Countertrade as well. * Michael Escaler's wife and cousin, Patricia de Leon. Under the CARP law, a married couple is considered one conjugal unit entitled only to a maximum of three hectares. Michael and Patricia de Leon- Escaler got three hectares each. * Juan, Mark, and Margarita Escaler, all shareholders in PASUDECO. * Francis Escaler, a stockholder both in PASUDECO and Sweet Crystals Integrated Sugar Mills. The Escalers are also heirs of Ernesto Escaler, former chief operating officer of Pepsi Cola, and a relative and associate of former Marcos crony Eduardo Danding Cojuangco. * Marie Yvette L. de Leon, director of National Life Insurance Co of the Philippines. * Alfredo de Leon Panicucci, a businessman who imports clothes and runs the Linea Italia stores. * Gabriel de Leon, who is listed as one of the top 100 stockholders of the Bank of the Philippine Islands. * Eight farmer-beneficiaries belonging to the de Leon-Madrigal branch, descendants of Don Vicente Madrigal, businessman-industrialist and former senator who owned, among many other companies, the Madrigal Shipping Lines. They are also related to newly elected Senator Jamby Madrigal. * Felina Maligaya, who is listed as a stockholder of Daniel Agricultural Corporation owned by the de Leon-Jalandoni branch of the family. The land and the family that owns it both have a colorful past closely intertwined with the nation's political and economic history. The de Leon land used to be part of the 1,200-hectare Hacienda Tinang once owned by the revolutionary general Servillano Aquino whose huge wood-and-brick house still stands in the center of Tinang. In the book Aquinos of Tarlac, writer Nick Joaquin narrates that the general bequeathed Tinang to his son Benigno Sr. upon his marriage to Maria Urquico, daughter of another wealthy Tarlac family. But Benigno Sr. was forced to hock the hacienda to finance his activities when he became a member of the Philippine Legislature from 1919 onwards. Joaquin says that as Tarlac representative, Benigno Sr. refused to take money from the government; he donated his salary to charitable institutions and personally funded his official trips across the country and abroad. "What was left of my father's lands had been sold during the war to feed us," Joaquin quotes Benigno 'Ninoy' Aquino Jr., as saying. "Most of them were already mortgaged before the war: Murcia, Lawang, and Tinang." How Tinang ended up with the de Leons is unclear. But the Transfer Certificate of Title to the Tinang property indicates that in the 1930s, ownership of the land passed into the hands of Benigno Sr.'s brother-in-law Manuel Urquico, whom Joaquin describes as "a speculator who lost something like P25 million pesos in the (U.S.) stock-market crash of the mid-30s." It could well be that Urquico sold the land to the de Leons, who have long been prominent in neighboring Pampanga. Like other landowners, the family made its wealth from lending money to cash-strapped farmers and planters who had land to offer as collateral.The clan traces its roots to patriarch Jose de Leon, a Pampango sugar planter in the early 20th century. In Sugar and the Origins of Modern Philippine Society, scholar John Larkin classifies de Leon as among "the very rich (who) created their fortunes by supplying credit mainly through the pacto de retro: loaning money with land as collateral in good times and bad (which) offered the surest way to profit." Larkin says that those who went on to amass greater wealth, Jose de Leon included, "knew as well how to benefit from harsh economic times," acquiring large parcels of land through credit schemes for hard up farmers and planters in the years after the Philippine revolution. De Leon also invested in other ventures, including the Pampanga Electric Light and Power Company. But his family is more closely associated with PASUDECO, a company being managed at present by descendant Michael Escaler. In its heyday in the 1920s, PASUDECO differed from sugar centrals in Negros in that it was owned not by just one family, but by a group of families whose names and corporations recur in this story. "PASUDECO was funded not by a single powerful native family or by foreign capital but by a group of individual and family interests in a kind of cooperative effort that reflected the homogeneity, trust and myriad relationships that existed among the Pampangan elite," Larkin writes. Among the other prominent Kapampangans who invested in PASUDECO were Augusto Gonzales, Manuel Urquico, Honorio Ventura, Francisco Liongson, and Jose Escaler. Pampango historians say Ventura was a politician who sent the brightest local children to school, among them a boy from Lubao named Diosdado Macapagal. Jose de Leon would eventually put up, along with other investors, the National Life Insurance Company of the Philippines, a firm now situated along Ayala Avenue in Makati, the same building where some de Leon descendants and "farmer-beneficiaries" still hold office. Larkin recounts that de Leon died violently in 1939, when he was gunned down in the heat of a dispute between sugar planters and millers inside the PASUDECO offices. By then, he had amassed enough wealth to last many lifetimes and withstand many generations. That wealth was passed on to his son, Jose Joven de Leon, father of the siblings in whose names the 212-hectare Tinang land was titled before it was placed under CARP. Court documents show that when Jose Joven de Leon passed away in 1974, he left shares of stock in some 40 corporations that included Bacnotan Cement Industries, the Bank of the Philippine Islands and PASUDECO, as well as more than a hundred parcels of residential, commercial, and agricultural land in Manila and the provinces of Rizal, Pampanga and Tarlac. DAR's Inocencio even quips that the de Leons have so much real estate property that "they have no real idea where all their lands are. "Many of their vast landholdings have been targeted for coverage under CARP. The government is now processing payments to the de Leon descendants for other property purchased by the government under the CARP's Compulsory Acquisition scheme. To DAR and Land Bank employees then, the de Leons are considered cooperative landowners. That is, were it not for the infraction they committed in their Tinang estate. 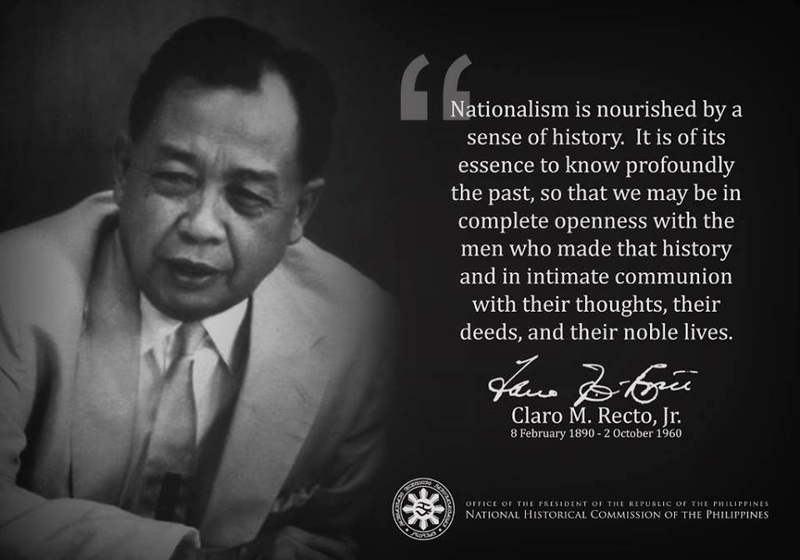 WHAT IS NATIONALISM [Filipino Nationalism] ?